At his clinic in Bietigheim-Bissingen near Stuttgart and Ludwigsburg, Dr. Kreisel offers pain therapies using Platelet Rich Plasma PRP / Autologous Conditioned Plasma ACP as a special therapy form of autohemotherapy. This method of treatment has regenerative, anti-inflammatory, pain relieving effects, protects the cartilage and in particular helps to relief pain of arthritis and sports injuries. The high efficiency of the therapy is proved by numerous scientific studies and researches. Furthermore, latest studies show excellent results in the combination with Hyaluronic acid HA. In particular the interstitial and intra-articular laser therapy can successfully be used in combination with PRP/ACP therapy. 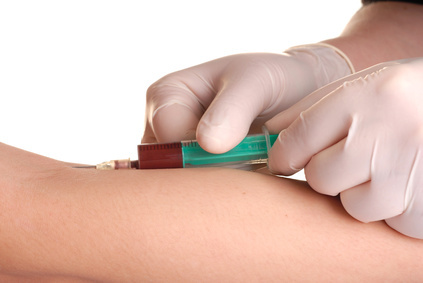 The treated joint or inflamed spot is irradiated with the laser directly after PRP/ACP injection to stimulate cell activity and regeneration of the tissue. According to our longterm experience latest studies show excellent results in the combination of PRP/ACP with Hyaluronic acid HA.